The Sea Fox 220 Viper is described as a bay boat, designed for inshore and nearshore use, featuring everything a serious angler would want. However, the 2016 Viper does have lower sides compared to others in the Sea Fox range and, yes, this did provoke some doubt regarding its offshore ability. But that doubt was soon laid to rest after a play in the waters off the Gold Coast. While our test day was not overly rough, the 220 Viper soon proved it is very much at home in these conditions. It remained very dry no matter which direction we tackled the swell and, when airborne, returned to earth with a soft entry. So, while this Sea Fox might not be classed as a true offshore fishing boat, it’s comforting to know that when the weather turns nasty the Viper is more than capable. 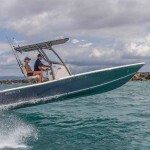 Foxy Fisher - At first glance it might seem like the viper is yet another centre console aimed at diehard fishos. But this Sea Fox offers something for everyone. WHAT LIES BENEATH - Stepping aboard the 220 Viper, it is obvious that this is very much a fishing-focussed boat. 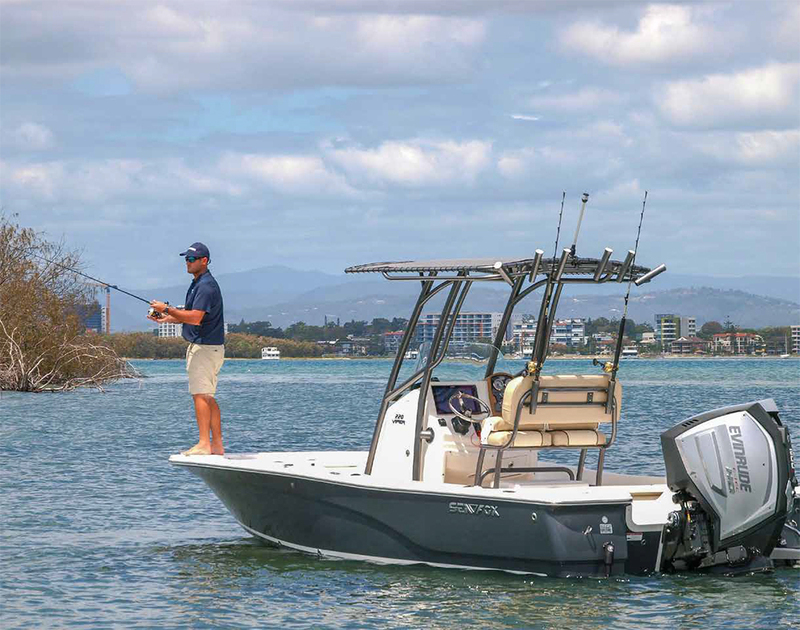 Sure, there are a handful of creature comforts to keep the family happy – such as convertible aft seating and a full-size head compartment with a Porta Potti – but you can’t hide the fact that this vessel is built for fishing. The bow provides a raised casting deck that is perfect for lure-casting and fly fishing, with good working room for two anglers. An optional feature up here is a padded fishing chair, as was fitted to our test boat. The deck sole includes several large compartments – some with optional gas shocks – and a dedicated anchor locker up forward, plus a large fish box aft of that. Running along either side of the Sea Fox are two long lockers. One is a lockable five-rod storage hold and the other is for general storage, but would also swallow some extra rods. Another locker forward in the centre will take care of the life jackets and other equipment. In addition, there is under-deck storage, complete with a 20lt bucket. Every compartment is insulated. In front of the centre console is another of those creature comforts – a padded seat for two, with a high backrest. Underneath hides a 38lt plumbed bait tank and further forward, an optional bow cushion package can extend your luxury. As mentioned, the centre console houses a day head with Porta Potti and a privacy door. Also in the console is dedicated storage for two or more batteries. The Sea Fox also comes prewired for a trolling motor to make life easier. TICKING BOXES - The helm is thoughtfully laid out with clever ergonomics. Our test boat was fitted with the optional $7700 electronics package, which includes a Simrad NSS16 evo2 touchscreen which filled the space nicely to the left of the wheel. Engine gauges and two banks of accessory switches occupy the space on the right, giving the helm a clean look. The top portion of the dash provides a flat surface for a compass or for placing items like phones, camera or binoculars. Helm seating in the Viper is customisable. Our test vessel featured a leaning post and backrest with rodholders on the back, with a 68lt removable icebox tucking neatly underneath. Bucket seats are another option, according to Jeff McNiven, director of Gold Coast importer JSW Powersports. “The advantage with bucket seats is that if you are doing a lot of trolling you can turn the seats around,” he said. “If you fish out the back on anchor regularly, the bucket seats become a better option.” As part of the ‘Pro Package’ fitout, this Sea Fox includes embossed floor mats at the helm and LED lighting in the livewells for night fishing, plus a few extra gas struts on the lockers. The T-top was previously an option, but now comes as standard. These are built like the proverbial Sherman tank and include six rocketstyle rodholders (four set upright and two angled for trolling). There is, however, the option of a folding T-top for those who have restricted garage space. LITTLE THINGS - The aft section of the cockpit provides an extra casting deck. This deck hides three padded flip-up seats with drinkholders – perfect for the family when the weather stops you going fishing. A 98lt aerated livebait tank fills the space under the centre seat. Aft of this tank is the standard raw water washdown. Fresh water washdown is also available as an option, as was installed on the test boat. Self-draining decks with flush fittings are all standard and every Sea Fox model scores stainless through-hull fittings, while every outlet goes directly overboard, including the kill tanks. Twin 1100gal/h pumps take care of any water in the bilge. The float switch activates only one pump, but each is on an individual circuit, so if one fails, the other one should still save your bacon. 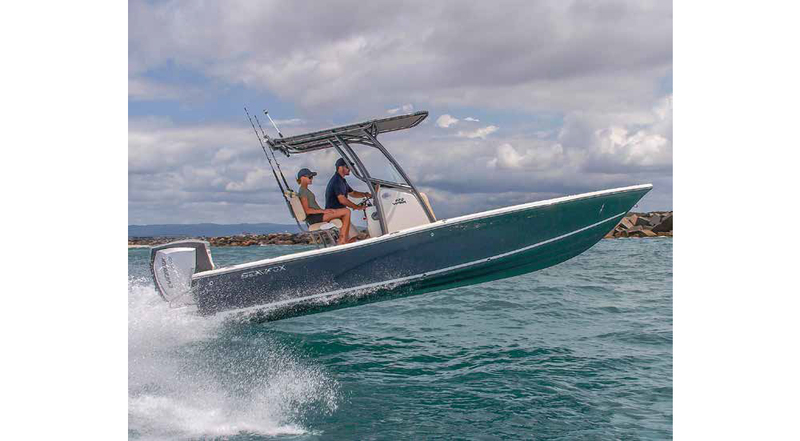 While the maximum horsepower rating for the 220 Viper is 250hp, our test rig was powered with a 200hp Evinrude G2 HO outboard, making it a very slippery boat. The lowdown torque certainly had the Sea Fox out of the hole in a flash. To make life easier, the E-TEC i-Trim system automatically trims the boat to match its speed, but this system can be overridden so you can take control of it manually if the need arises. The price of the Sea Fox 220 Viper starts at $71,400 (with 115hp motor) and really offers a lot for the avid fisherman. The price of the 220 as tested is $96,210, but this does not include the added $7700 Simrad package. A trailer will add another $8490. Sea Fox began building boats about 20 years ago. 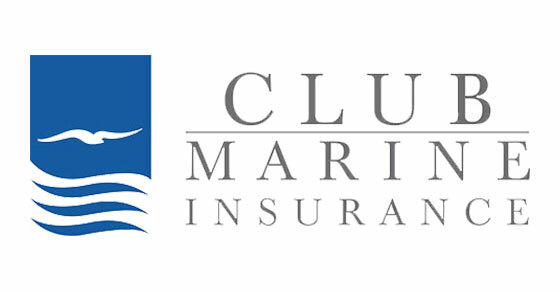 The US company has changed hands several times, but for the past six years it has been owned by a small group of Carolina fishermen who know boats and know fishing. The Sea Fox 220 Viper is certainly testament to that.